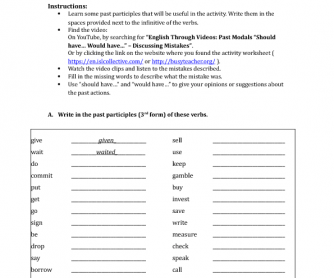 This fun video activity is to practise using past modals "should have.." and "would have..." to discuss past mistakes. The video describes the top ten stupid mistakes made by people. Learners should listen and fill in the missing information to show they understand the mistakes. Then they can give their opinions and suggestions about the past using past modals. This can be done as a speaking and/or writing activity. There are more detailed instructions in the worksheet. Or search YouTube for: "English Through Videos: Past Modals "Should have...Would have..." - Discussing Mistakes"